Simple things first – where are you guys from and how did you meet? Nina and Phil initially met online through Myspace. Nina asked Phil to book a Camden town show for a visiting band from New York called Rick Blaze and the Ballbusters – she was singing backing vocals for their short UK tour. They then met in person at the now defunct venue Punk in Soho, where Phil was playing at an album launch at the end of a European tour for his then band The Duel. They met Dave through a website called Bands in Town, auditioned him and he was in. Drummer Pumpy is an old friend of Phil’s, he was also playing on that fateful occasion at Punk, Soho. This line-up has been playing now for about a year, though there were other line-ups before. Phil and Nina’s first gig with Healthy Junkies was in October 2011 when they played at a disastrous all day Punk Festival in Brighton where the promoter ran off with the money. 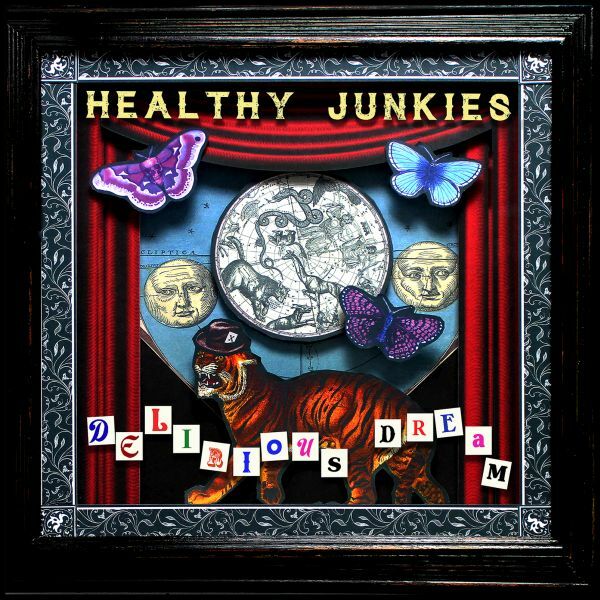 The name Healthy Junkies was initially a joke. Nina called Phil a Healthy Junky because he was and still does cultivate the Kombucha mushroom from which he makes a health drink, while at the time smoking pot as well. Since then the name has really come into its own with the band’s shared opinions on corporate pharmaceutical giants enslaving people with drugs such as Prozac into lobotomized slaves. The most recent single “No Control” tackles the current mental health epidemic that has swept through western society. Nina is a massive grunge fan, particularly Nirvana. Also bands like the Doors and Led Zeppelin which she was exposed to by her parents when growing up have undoubtedly influenced her. Phil was first inspired by British new wave and post punk bands like The Skids and Bauhaus while having been exposed to the likes of The Rolling Stones, The Kinks, Deep Purple, Hawkwind and The Groundhogs via his elder brothers’ and sisters’ vinyl collections. Dave is also a Nirvana fan but has introduced Phil and Nina to some of the new wave of garage rock with bands such as Bass Drum of Death and Ty Segall. Also King Gizzard and the Wizard Lizard and the Oh Sees are regularly played on the way to gigs in the van. Our music is a real cross-section and amalgamation of genres such as punk / grunge / psychedelic rock / garage rock and even a touch of old school goth thrown in their for good measure. There has never been any particular plan or theme for the lyrics but playing on the punk scene alongside bands such as The UK Subs, GBH and The Rezillos as well as all the many underground punk outfits has given the band a more confrontational approach lyrically, particularly on the third album Box of Chaos. We write about anything that moves us really. Mixing up fact and fiction to suit the song, maybe tell a story, maybe not. That is the beauty of being in complete control of what you write. You can say whatever you feel like saying. Our live show is a show. It’s dynamic, theatre-like, chaotic in places but melodic and ferocious. It changes depending on the mood of the band and the nature of the audience on each night. 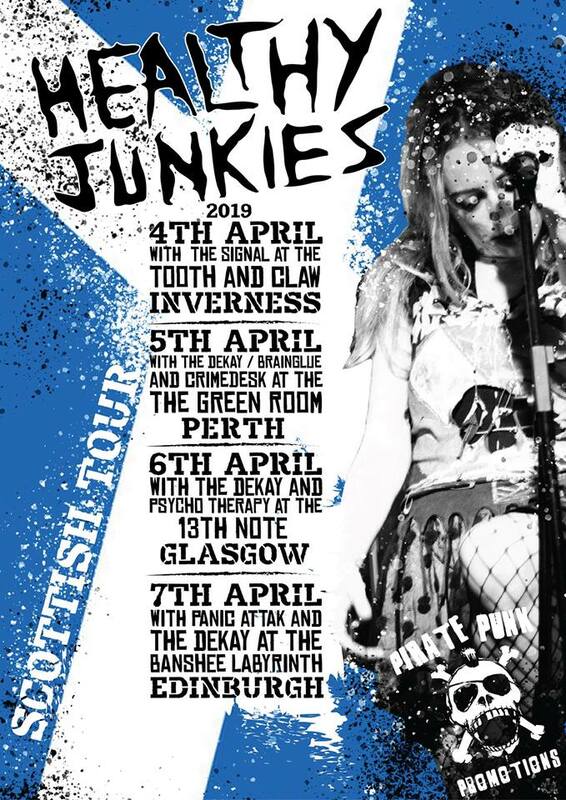 We have played a few hundred shows now as Healthy Junkies. Well Dave is quite a livewire, or should I say time bomb, waiting to go off. He is partial to stage diving although there was that one time when he dived into the audience who then parted like the Red Sea leaving him to fall flat on his face. Nina is wild on stage, like a demented mental patient out on day release. She wriggles and she squirms and leaps into the audience at will. Jumping either from the drum kit or into it is also a favourite trick of hers. The idea is to achieve complete abandonment on stage… Sometimes off stage too! We are going to the USA for a tour from October 19th to November 5th. We are also playing some shows in Europe in late November / early December. From previous Band of the Day Hey Charlie: What is your dream venue to play? Nina – Carrying the equipment. Dave – Packing the van/playing cover songs (with exceptions). Phil – Those nights when you just don’t feel it. Fortunately that does not happen often though. And from Crejuvent: Why do birds suddenly appear every time you are near? They don’t. At least not that we have noticed. You may be thinking of the angels of course, I guess they are looking out for us.